Recent years, industrial motors are preferred to be switched to high efficiency motors from traditional general purpose motors to reduce energy. Large air heaters in public facilities are switching to high efficiency motors from traditional general purpose motors. In other hand, issues have occurred after installation in the market. Though the cause of these issues may vary, one of the main causes is the high inrush current. High efficient motors have higher output and rotating speed than general-purpose motors which leads to high electric current value. Inrush current up to 5 to 10 times the stationary current can be expected for induction load of a motor in general, but in high efficiency motors, the amount of electric current will be larger (Ex. up to 170Apeak in 2.2kW motor). 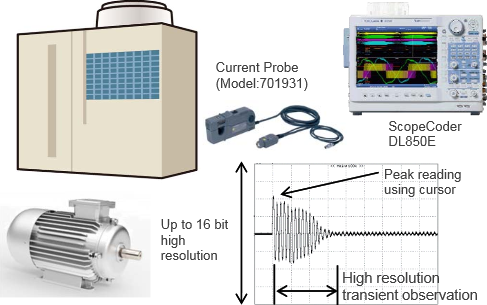 Since high accurate electric current waveform can be measured by combining DL850E and the current probe, by precisely understanding the transient change of electric current and the inrush curr ent peak value, issues can be resolved more quickly during installation by verifying features of high efficiency motors. Transient changes of inrush current can be measured and recorded by using DL850E and large capacity 500Arms current probe. Since DL850E is equipped with long memory, it can measure transient change from inrush to stationary state by high timeline resolution and confirm peak current value as a number by moving cursor to electric current waveform displayed on the screen. Also, peak current value can be read by high resolution, since maximum vertical line resolution is 16 bits. In addition to this, DL850E can not only serve as evaluating motors but it also can be used for evaluating heaters since DL850E is capable of recording gas pressures, flow rates, and temperatures to multi channels by using wide selection of 19 input modules. Furthermore, it can be used to observe floating voltage waveform of power unit circuit board. Current probe with 500Arms, DC-2MHz bandwidth (701931) available. Pear current reading using the cursor, transient verification from inrush to stationary state. Available with 19 plugin modules. Can combine and install up to 8 modules. Record up to 16 bit of high resolution data. Record waveform and measurement screen image with just a push of a button. Simple and secure to store on-site measurement data.